David J. Mikulis, MD is Full Professor and Co-Director of Medical Imaging Research in the Dept. of Medical Imaging at the University of Toronto and the University Health Network in Toronto. He holds two additional directorships in the Dept. of Medical Imaging including the Director of the Radiology Residency Research Program, and Director of the Functional Imaging Research Lab. 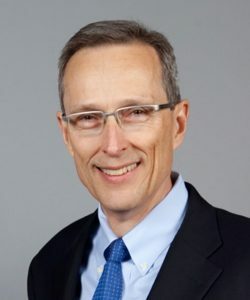 The primary emphasis of his work has been translational research focusing on the application of novel imaging methods to the clinical environment. He established one of the first fMRI labs in Canada in 1993 and is currently involved in developing advanced neurovascular imaging methods with major program arms including: 1) quantitative measurement and clinical application of cerebrovascular reactivity (CVR) metrics using a patented device (RespirActTM) that enables precision control of blood oxygen and carbon dioxide, and 2) high resolution and functional imaging of intra and extra-cranial blood vessel walls, and 3) input function independent penumbra imaging in acute ischemic stroke. Work in these areas has led to the discovery of a form neurovascular uncoupling that may explain the origin of chronic ischemic white matter injury a major contributor to vascular dementia.